The course focuses on service capacity limits, equipment and system disconnects, and safety and labeling requirements for PV systems. 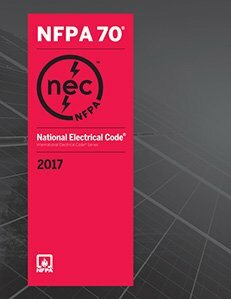 The course also shows the important changes from the 2014 NEC, and provides 6 advanced training hours for NABCEP Installation Professional re-certification. It also includes mixed Question and Answer (Q & A) exercises throughout the presentation to help you assess your progress throughout the course, with instructor e-mail support and feedback specific to each participant's needs. The course provides 6 NABCEP approved training hours for certification and re-certification CE credits, and 6 continuing education NEC credits. A Solairgen Certificate of Completion will be issued upon successful completion of the course providing each student with 6 qualified training hours. A strong foundation of PV systems knowledge or experience is necessary prior to taking this course. This course was designed by Mr. Kelly Provence, an IREC Certified Master PV Trainer and NABCEP Certified Solar PV Installation Professional, and Certified PV Technical Sales Rep. Mr. Provence is also a licensed Master Electrician.